The Great Barrier Reef is the world's largest coral reef system, composed of roughly 3,000 individual reefs and 900 islands, that stretch for 2,600 kilometres covering an area of approximately 344,400 km². The reef is located in the Coral Sea, off the coast of Queensland in northeast Australia. 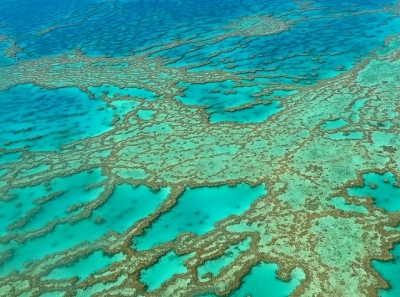 A large part of the reef is protected by the Great Barrier Reef Marine Park. The coral reefs hold a huge biodiversity, with dugong, whales, Dolphins and turtles among the most notable marine species. I visited this WHS in December 2017 and January 2018 from Hamilton Island and from Cairns. In all I dedicated a week to this extensive WHS to be able to cover different areas and features of this marine WHS by boat, by plane and by helicopter. Even though I travelled to some of the most beautiful marine areas in the world (ex. French Polynesia, New Caledonia, Maldives, Seychelles, Caribbean), none are comparable to the Great Barrier Reef not only in terms of size but in terms of the different hues of blue/turquoise, the clarity of the water, the variety and amount of marine life. This applies both underwater and from above. Since we visited during stinger season, we wore a stinger suit when snorkelling to be on the safe side. Being such a vast area, you get to see and experience different things depending from where you're based. The World Heritage Area Boundary withing the GBR Marine Park stretches from beneath the Torres Strait to just above Fraser Island excluding harbours and islands. For the first 5 days we stayed on Hamilton Island, one of the Whitsunday Islands, and every day we did a different excursion to the Great Barrier Reef (GBR). Already from my window seat, flying from Brisbane, I enjoyed an incredible aerial view of two of Australia's great WHS - Fraser Island and the GBR. First I saw never-ending sandy beaches, dunes and trees. Then the sheer beauty of the GBR and the Coral Sea islands and islets. Even though the effects of the last cyclone are still visible with dead trees along the coast, the views of Whitehaven Beach and Hill Inlet on Whitsunday Island are a great treat you shouldn't miss while cruising/snorkelling/diving around the GBR. Swimming with manta rays, dolphins, turtles, sharks and colourful reef fish of all kind is practically guaranteed when exploring the GBR from Hamilton Island or Airlie Beach. Excursions aren't cheap and distances to cover require full day trips to be able to enjoy yourself without constantly keeping an eye on the watch. As is the case with most tourist destinations in Australia, everything (and I mean everthing) is owned by monopolies so ultimately you'll always pay the same people (Hamilton Island.com) for accomodation and travel. A company worth checking out for group excursions and helicopter/sea plane tours from Hamilton Island/Airlie Beach is Cruise Whitsundays. The snorkelling trip at Heart Reef and Heart Pontoon was incredible. If you have enough time (and money) there's the option of sleeping here in the middle of the GBR which means you'll have the place to yourself before/after the first boat arrives (or else there are also some liveaboard boats too). We spent the best part of two days snorkelling here and there was always a close encounter with countless new marine species to be had with every snorkelling session. The highlight was interacting with a very friendly and curious two metre Maori wrasse. 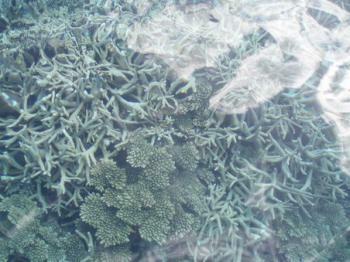 The variety of coral is rightly the central reason justifying the GBR's inscription and OUV. We headed next to Cairns and again the aerial view of the many atolls and scattered coral reefs was definitely a plus point, but it wasn't comparable to the huge reef further south. 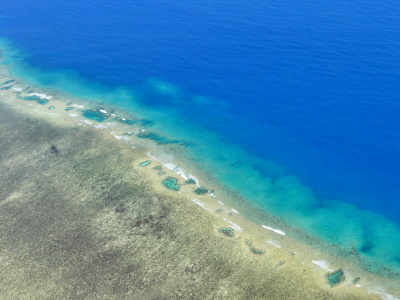 Unfortunately, we confirmed our initial thoughts after allowing a further two days to the GBR with Cairns as our base. Even the local city council is aware of this and in fact there were all sort of billboards and adverts depicting pictures of the GBR around the Whitsundays or further south and stating that "if you're looking for the heart of the Great Barrier Reef, you're in the wrong place! Don't worry we can take you there". That said, we still enjoyed our excursions to the outer barrier reef, to Green Island and to Michaelmas Cay. The highlight here was spotting a fever of blue-spotted stingrays. There are much more people on tours/excursions from Cairns simply because there are daily international and charter flights to/from Cairns (mostly from China, Hong Kong, Taiwan, Singapore, South Korea, Indonesia, Japan, etc.). Should I ever go on a repeat visit to Cairns in the future, I would definitely opt for a proper visit to Cape Tribulation and Daintree National Park, however it would probably be more for the rainforest/birdwatching than the marine experience. Even if global warming, climate change and human activity are having a very negative effect on the GBR, the sheer size, colours and beauty you still can experience and see for yourself both underwater and from a seaplane/helicopter tour (photo) are truly indescribable. I generally prefer cultural WHS to natural WHS but the GBR truly deserves to be on everybody's bucket list hands down. The Great Barrier Reef is as impressive a natural wonder as its name suggests, a wonderland of marine life stretching almost 1400 miles along the northeast coast of Australia. When I planned my trip to Australia in 2012, this was one of the sights I was determined to visit, and it was as beautiful as I had hoped. I used Cairns as my departure point for a full-day snorkeling and snuba tour of the reef. The guides were helpful to point out starfish and giant clams, as well as a shy octopus blending in with a nearby rock. Hidden amongst the anemone were colorful clownfish, while silver schools of mackerel swam above. Our tour also saw reef sharks and stingrays, although we kept a safe distance. I was particularly impressed with the coral, which was brightly colored and magnificent to behold; I'm glad I saw it in 2012 before the recent bout of coral bleaching struck in 2016. The warming ocean temperatures off the coast of Australia are a valid concern, and I'd hate to see long-lasting impact on the unique biodiversity of the reef. Australia is full of wonders on land and sea, and I found the Great Barrier Reef to be an unforgettable marine adventure. Logistics: The Great Barrier Reef stretches from the Torres Strait to Fraser Island. 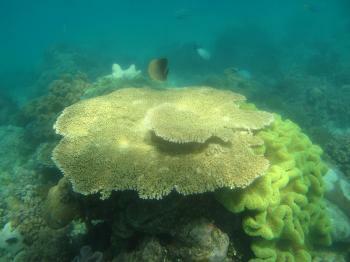 Tours of the reef can be arranged in cities and towns like Cairns, Townsville, or Port Douglas. The Great Barrier Reef was one of the few things I knew about Australia before I decided to go there and started planning my trip. Of course I had to go and see it, although I am not a water person and I don't like swimming in the ocean. So when I stayed in Cairns, I chose a tour operator offering trips including a glass bottom boat, and I liked it. I am sure it is nothing like snorkeling, but still I enjoyed what I saw and was fascinated by the underwater world. Later, when visiting the Whitsunday Islands, I did another tour and this one was even better because the water was so clear and still that I could see the corals straight from the boat, without having to use the glass bottom. I think I don't have to write anything else - it is famous enough already, and a "must see" for most people when visiting Australia! Read more from Mirjam S. here. The Great Barrier Reef was one of the best experiences in my life and i will never ever forget it. Go there and you won't regret it. I'm not much of a swimmer but I wouldn't go to the Great Barrier Reef without snorkelling. I'm so glad I was up for it because it was quite amazing to see the different varieties of fish! From Airlie Beach, I took a two-day boat trip out to the Whitsundays. I got a bit seasick but it was worth it, especially to come into contact with rainbow lorikeets! What a place this is! I'm not much of a marine person, but I don't think I'll ever forget my visit to this part of the world. Just go, you won't regret it. I visited the Great Barrier Reef via a liveaboard dive boat in March 2005. I've been diving all over the world, but this place tops them all if there was an "overall best" category. Marine life was prolific and varied and conditions were fantastic. It truly lived up to its name as being "Great". I´m not much of a sailing/diving enthusiast, but I did do a boattrip from Cairns to the Reef with some snorkeling, and I must admit it was really fantastic. You could see lots and lots of the most bizarre and colorful fish and corals, as well as big sea turtles, all in an evidently unharmed environment, despite the danger that global warming poses to this great site. If I decide to learn to dive, I´d probably come back here. The great barrier reef was one of the most fun holidays that i have had in a long time. i found it very worth while. i caught a bus that took me there and back to school. the only thing that was disappointing is that when we got back to school we had to write a 6 page essa and i had over that amount.My teacher is planning another field trip soon and that has encouraged me to learn more about the great barrier reef that is how i found your wonderful and mind blowing site. We have recently experienced a wonderful cruise to the great barrier reef. We went snorkelling on a pontoon. The beautiful fish will never be forgoten in my memory. The coral was as alive as ever and swaying to and fro with the current. AND i didn't get bitten by a shark! It was wonderful! Leprosy: Fantome Island. A leprosarium was established on the island in 1927. Upon its closure in 1974 it was purged by fire. The island is the site of 200 graves"
Affected by El Niño: "Great Barrier Reef's recent El Nino-triggered mass coral bleaching "
Marine sites: Total inscribed area of almost 35million h. Exact ratio of terrestrial - marine not stated but must be significantly scewed towards "marine". Archipelagos: (Tectonic Uplift and Deposition). The reef itself is not considered an "Archipelago" but it includes a number of islands which are the remains of a mountain chain. The "Cumberland Islands Archipelago" consists of some 70 inner continental islands of which some at least are inside the inscribed site e..g "Located in the southern part of the Whitsundays, Keswick Island is a member of the Cumberland group of islands and is within the UNESCO World Heritage Great Barrier Reef area. 230 Community Members have visited.